This month, I am having one of those proverbial “milestone” birthdays. These events can provide a pause in life to reflect, celebrate or mourn(!) the passage of time and the realization that there really are fewer years ahead than behind. When I look back, I know I have been blessed with a wonderful family, good friends and truly nice people with whom I work (both staff and volunteers). Challenges have occurred along the way, but those experiences can make us stronger, more emotionally mature and, one hopes, a little wiser. I have spent almost half of my life in and around the American Counseling Association, so it obviously represents more than just a job to me. My time with the organization has been an experience. In some ways, it has been a long-running experiment in which I have had the great pleasure of testing out ideas and theories to benefit those associated with ACA. The first question is somewhat facetious (although there was a time at ACA when we couldn’t just laugh that question off). The second question is one we all need to ask as it relates to the various situations in which we find ourselves. At the end of the hour, the day, the week, the month, the year, the career — did we leave this situation/place/job/client/student in a better place than when we started? Do you ever ask yourself that question? If so, what have you learned from the answer? For those situations in which things have worked and are measurably better, I feel good and even take pride in my contribution. For those times when I have to answer “no,” I push myself to learn how things could have gone better or been more fulfilling. Today’s world provides us with information about issues, crises, calamities and disasters more quickly than at any time in history. I think this is good because it helps us make midcourse corrections so that we can be better at our jobs — whether as professional counselors, counselor educators, advocates, parents, partners or friends. Here is something to validate that observation. Look at the front page of today’s newspaper, be it USA Today or your local paper. It can be the old-fashioned print version or the digital one. Now read any story on that front page and tell me how the work of professional counselors would have made that situation better. I can pretty much guarantee that you would be able to share with me how you and your colleagues could have played an important role. In fact, feel free to email me at the address below to let me know what you found. I know the work of professional counselors is challenging, and I want you to know that 99.9 percent of the time, I do believe that the profession makes an incredible difference in the lives of those you serve. I hope you will take that into account when asking yourself that question (whether you are 30, 40, 50, 60, 70, 80, 90 or 100-plus). I am grateful for your work and for the difference you make in society each and every day. The heat of August is upon us. Some families are preparing for back-to-school events, while others are still enjoying well-deserved vacations. Still others may be participating in career or business opportunities that inform career development. I have always loved the end of summer, when the light is beginning to be different. For most, there is time to just breathe, contemplate and reframe what may have been a busy past few months. For many people, however, this summer has been far from quiet. In fact, it has been fraught with sadness and disbelief. On June 12, I was awakened before 7 a.m. by a text and a phone call alerting me to watch the news. What I saw impacted us all. Initial reports of the hate-filled massacre of individuals enjoying a night out with friends and family at Pulse, a popular gay club in Orlando, Florida, left me shocked, angry and terribly saddened. Early reports said 20 people were dead. Ultimately, that number rose to 49 individuals, the majority of whom were there to celebrate, dance and have fun because Pulse was hosting Latin Night. The deceased were also predominantly members of the LGBTQ community, along with their friends and family members. As that Sunday passed, I continued to sit and watch the news coverage, unable to turn away, unable to stop seeing the violence, the senseless tragedy and, ultimately, the massacre at Pulse. As counselors, counselor educators and counseling students, try to imagine if that had been your community, your culture or your identity group. Consider the very first thing you might have thought — your gut reaction. Most of us might naturally have wanted to know what to do, how to help. I think we felt so much sadness collectively as a nation, and people from many other nations shared in this sadness. There was also anger — anger about gun violence and hate-generated acts of violence against a population. Accompanying that anger was frustration that at that moment, we had no power to change the outcome or strike it from our minds. And we are counselors, equipped to help in the aftermath of tragedy, of crises. When we as counselors offer hope, act with courage and reframe negativity into a level of positivity, we are helping. We are serving. We model our skills by being able to assist in a nonjudgmental manner; we offer hope to a population and individuals who have experienced shameful discrimination for most of their lives; we act courageously as advocates and supporters. The three words at the top of this column, and which you also saw in my first column — positivity, hope and courage — are important to the personal spirit and mental health of all of us. Counselors have influence in communities, with families, and in schools and agencies. When we know that truth internally and believe that we do make a big difference (sometimes all the difference) by courageously standing up to support and assist our clients and the communities in which they live, counselors gain strength. We are strong! By now, you have heard that the ACA 2017 Conference & Expo will be held March 16-19 in San Francisco (with Pre-conference Learning Institutes taking place March 15-16). A colleague of mine said that was indeed a “poetic choice,” and with that, I concur. ACA will be in San Francisco, which is beautiful, welcoming to all and a wonderful conference city. Please join us — there will be much to do, many networking opportunities and, most important, a solid offering of workshops and sessions of interest to all counselors, counselor educators and counseling students. From my viewpoint, this is a confluence of circumstance that highlights ACA’s brave and strong stand against discrimination, a celebration of diversity in its deepest and most authentic way, and the promotion of positivity, hope and courage to our great profession. They will all meet in San Francisco, and you just may leave your heart there. I am incredibly humbled and proud to be writing to you, our ACA members, every month. Let us never lose track of who we are, what we do as counselors and the potential we have to contribute to the greater good. The term infant mental health originated in Britain, where much of the foundational research on infant social development began. Researchers such as John Bowlby, Mary Ainsworth and Donald Winnicott introduced us to the importance of our first social relationship: the infant-caregiver relationship. Infant mental health generally refers to the promotion of social and emotional development in infants and young children ages birth to 3 years. Sometimes the term early childhood mental health is used to expand the age range up to 5 years. To infant mental health providers in the field, the terms are interchangeable, and for this article, I will use the standard term infant mental health. As the collective knowledge of child development and neuroscience expanded on the British researchers’ foundational work, the infant mental health movement grew stronger and spread throughout the world. Rigorous empirical studies from interdisciplinary groups of researchers conclusively determined that what happens in an infant’s early life can have a profound impact on his or her adult development. There are several core concepts in infant mental health that come from decades of research and inform our practices. First, neuroscientists have discovered that an infant’s brain grows remarkably fast in the first few years of life, making an estimated 700-1,000 new neural connections every second. 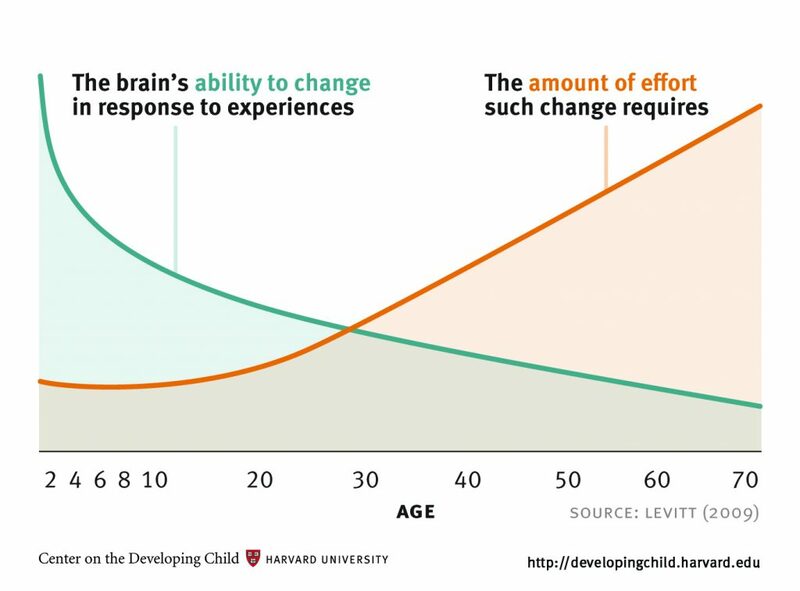 Pat Levitt, science director of the National Scientific Council on the Developing Child, summarized thousands of studies on brain plasticity into one graph to show how adaptable a young child’s brain is to growth experiences in the first few years of life. These findings propelled the early intervention movement, a service for children ages birth to 3 years with identified developmental delays. Infant mental health providers of all disciplines, including speech and language therapists, physical and occupational therapists, counselors and pediatricians, found that they could make huge developmental gains for an infant with developmental delays if they could provide their intervention services during the infant’s first few years of life. Getting these services early better prepared the infant for later academic and social success. For example, when I was a school counselor in an elementary school, I was responsible for coordinating the arrival of several new kindergartners who had received early intervention services as toddlers and preschoolers. Throughout the summer, I read their Individualized Education Programs and histories and knew what their educational and social goals were. I felt like I knew these children already, so when school started, I assumed I would be able to go to their kindergarten classrooms, identify these children and see how they were doing. When I arrived, however, I could not pick the identified children out from all the other new kindergartners in the classroom. I had to ask the teacher and double-check my list. The children were doing amazingly well. Those students who had received early intervention services continued to thrive throughout their time in my elementary school. Interestingly, the kindergartners who arrived without any history of early intervention services, but later were determined to have emotional, social or other developmental delays, were the students who struggled the most during their elementary school years. I had learned, firsthand, how early intervention services could harness the power of the developing brain during a child’s first few years of life and how children who had missed that opportunity for early intervention took much, much longer to catch up. In other words, to learn, grow and thrive, infants must depend on their caregivers. Without a caregiver’s consistent, sensitive attention and interaction, infant brains do not develop to their optimal capacities. The Center on the Developing Child at Harvard University describes this concept as a serve-and-return interaction in which the back-and-forth social interactions between the caregiver and infant help build the infant’s brain architecture and promote healthy development. Infant mental health counselors work with the infant and the infant’s primary caregivers to help the caregivers hear, see and understand the infant’s fundamental social and emotional needs. To see what serve-and-return interactions look like and how a lack of these interactions can affect an infant, watch Ed Tronick’s widely viewed “still face” experiment video (youtube.com/watch?v=apzXGEbZht0). 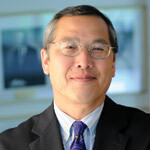 Tronick is a pioneer in the field of infant mental health and has been conducting still-face experiments for decades. In the experiment, we watch a mother first use serve-and-return interactions to engage with her infant. Then the mother withholds her serve-and-return interactions for two minutes to see how the infant responds. In that short time, we can clearly see that the infant experiences distress, and researchers have found biological markers that confirm the distress the infant feels when these back-and-forth interactions are stopped. Why does this matter? As we see in the video, the infant and mother quickly reconnect and delight in each other. One two-minute experiment is not sufficient to cause long-term damage to the infant’s development. But if the mother’s interaction had been withheld for a sustained period of time, this lack of interaction might have had a negative effect on the infant and the infant’s relationship with her caregiver, such as in instances in which a caregiver has clinical depression or a substance abuse disorder. In such a situation, an infant mental health counselor would work with the caregiver’s mental health provider and doctors to help the caregiver notice the infant’s need for engagement. The third core concept important in understanding infant mental health is toxic stress. The Center on the Developing Child at Harvard University describes toxic stress as long-lasting environmental stressors, such as in cases of child maltreatment, that over time cause damage to the infant’s developing brain. All infants and young children experience stress, but when the stress is prolonged and not attenuated by nurturing caregivers, it causes reductions in neural development. In such cases, infant mental health counselors are called in to conduct social and emotional assessments to determine if any social or emotional delays are present. If delays exist, the counselor works with the infant and his or her caregivers on the maximal ways to reduce the infant’s stress and return the child to a healthy developmental path. For example, an infant mental health counselor might be needed when an infant or young child experiences an extended separation from a primary caregiver, such as in cases of foster care placement, extended caregiver hospitalization or caregiver incarceration. These types of separations from primary caregivers can be traumatic to infants and young children and may cause heightened stress responses. Consider an 18-month-old male child separated from his mother so she can attend a drug treatment program. During the separation, the current caregivers notice an increase in the child’s sleep disruptions, tantrums and separation anxiety. During this difficult transition, the infant mental health counselor is called in to help the child manage his stress. The counselor also helps the caregivers better understand and manage the child’s newly developed symptoms in ways that are sensitive to his trauma history. When the mother and the now 2-year-old reunite, an infant mental health counselor might be called in to help reconnect and repair the relationship between the child and his mother, help the mother understand how the child was affected by the separation and help the mother respond to her child’s attachment needs. The research on toxic stress is robust and has applications to many dimensions of public health. The Centers for Disease Control and Prevention-Kaiser Permanente Adverse Childhood Experiences Study, conducted by Vincent Felitti, Robert Anda and colleagues and first published in 1998, asked more than 17,000 adults about their childhood experiences. The researchers found that the more adverse experiences the adult participants reported having as children, the more at risk those adults were for physical, social and economic difficulties, including heart disease, chronic obstructive pulmonary disease, depression, substance abuse, intimate partner violence and so on. Thus, intervening in an infant’s life may have profound impact not only on the infant’s current mental health but also on his or her future mental and physical health. 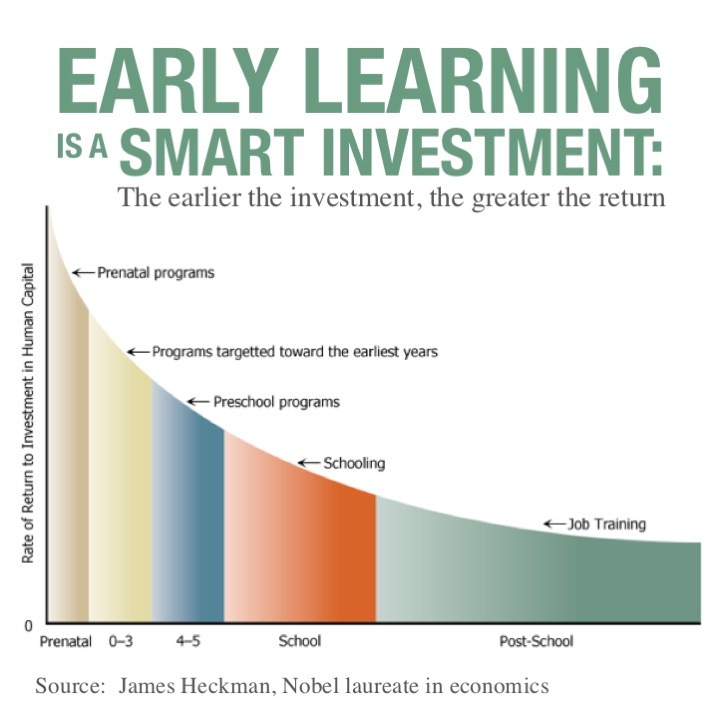 This finding has led to further research by economists, including Nobel Memorial Prize-winning economics professor James Heckman, who have determined that the more we invest in services for infants and young children, the bigger the return on our investment (see heckmanequation.org/content/resource/why-early-investment-matters). Courses and workshops are available that can help interested counselors become competent in infant mental health. In these courses, counselors will learn about the variety of valid tools used to assess infants of all ages and stages and the evidence-based clinical interventions for working with this population, including Child-Parent Psychotherapy and Attachment and Biobehavioral Catch-Up. Several states offer certificates of competency in infant mental health, and international conferences and journals address research topics in this area of practice. The brains of infants and young children ages birth to 3 years are in a delicate developmental position that may benefit from or be inhibited by factors occurring in their immediate environments. Infants and young children have social and emotional needs and can have mental health issues just like older children, adolescents and adults. There are evidence-based interventions to preventatively and positively impact these mental health issues. If a client has an infant or young child in the family, it is possible that the infant or young child may need a social-emotional assessment from a qualified infant mental health counselor. For example, perhaps you are a substance abuse counselor working with a client who thinks that his or her children are too young to be affected. Or perhaps you are a school counselor and notice that a family with which you work is struggling because the father has just been incarcerated and you know there is a newborn in the home. Your job may not be to work with the infant or young child directly, but you can let the family know that research speaks to how infants and young children can be affected by such events. You can also let the family know that counselors are available to work with the infant or young child and family to ensure that the child is meeting his or her social and emotional developmental milestones during this time of family stress. Finding an infant mental health counselor in your area can require some effort. The best way to begin is by seeing if your state or country has an infant mental health association. The World Association for Infant Mental Health has a worldwide list of its affiliates, or you can use an online search engine to see if your state has an independent association. Contact the association to ask for providers in your area. Another place to look for infant mental health providers is your local pediatrician’s office. The American Academy of Pediatrics recommends that all children be screened for social and emotional developmental milestones at the ages of 9 months, 18 months, 24 months and 36 months during the child’s yearly well-child visits. Most pediatrician offices have a list of support services available to caregivers with young children. Because of the high risk of trauma in children exposed to maltreatment, your community’s child protective services office should also have a list of infant mental health providers in your area. If you are interested in learning more about infant mental health, consider joining the Association for Child and Adolescent Counseling (ACAC), a division of the American Counseling Association. ACAC’s mission is to “promote a greater awareness, advocacy and understanding of children and adolescents, as defined as the ages from birth to adolescents” (see acachild.org). ACAC has sponsored several infant mental health workshops at the national ACA Conference and in the near future will host an ACAC conference at which infant mental health sessions will be offered. One of the core professional values of the counseling profession as listed in the 2014 ACA Code of Ethics is “enhancing human development throughout the life span.” One of the best things about being an infant mental health counselor is that I get to see this “enhancement” of human development. In fact, my goal is to prevent future mental and physical health issues. I have seen improvements in an infant’s social and emotional development through evidence-based infant mental health interventions in as little as six weeks. My hope is that this brief article has highlighted some important research findings for you as a professional counselor and that you will share the information about the importance of working with infants and young children with your clients, students and colleagues whenever it is pertinent. Together, professional counselors can enhance human development from day one. Evette Horton, a licensed professional counselor supervisor and registered play therapy supervisor, is clinical faculty in the School of Medicine at the University of North Carolina at Chapel Hill. 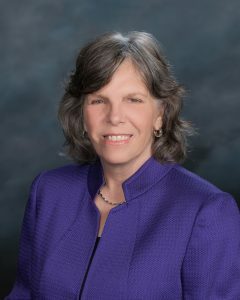 She is a founding and current board member of the Association for Child and Adolescent Counseling (ACAC) and serves on the editorial board for ACAC’s Journal of Child & Adolescent Counseling. 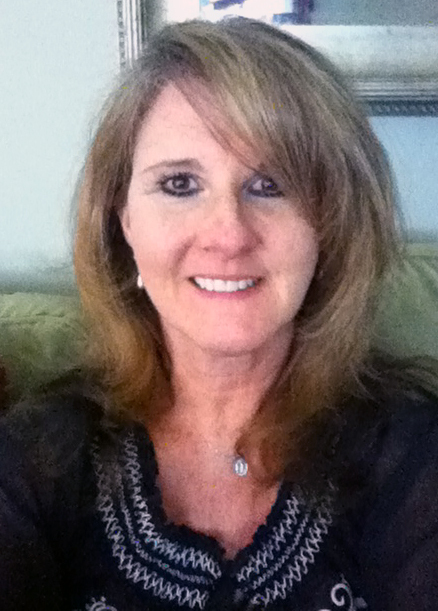 She is also a founding board member of the North Carolina Infant Mental Health Association. Contact her at evette_horton@med.unc.edu. I recently took on several home improvement projects. With a contractor hired, my home became a construction site for two weeks. I had pined over the built-in bookshelves, cabinets and window seat for so long that the books I had selected to place on the shelves were now in their second editions. Sawdust, spackle, paint and trips to the local hardware store became my new normal, but the inconvenience and chaos would all be worth it in the end. I had even thrown in a bathroom update project for my guest bathroom that had lain dormant since the 1980s. A new sink, faucet set, medicine cabinet and light fixture updated the look, especially after the dated tile backsplash was removed, spackled and painted. What a tremendous difference a light facelift can provide to the appearance and feel of a room. The final day arrived when I paid my contractor and began the arduous cleanup from two weeks’ worth of construction. With everything clean, I stood back and admired my new built-ins. I imagined what the custom pillow that was being sewn would look like when put in the window seat. I longed to place the books on the shelves and board games in the cabinets. However, the paint needed to cure (according to our contractor), so there would be no decorating for at least two weeks lest we put dents in the freshly painted built-ins. With a sigh (both of satisfaction and impatience), I took my admiration to the guest bathroom. It was so crisp with its new white marble sink and designer brushed nickel faucet against the blue walls. The large framed mirror (also brushed nickel) boasted ample storage in the cabinet. The three-sconce light tilted upward, shining new LED lights against the clean white ceiling. So classic and fresh: Blue and white, brushed nickel … and chrome? The glare from the chrome towel bars was blinding. I adjusted the towels a bit to cover the shiny finish. Unsuccessful, I turned the lights off, and then on again, to see if it had been just a momentary glare. Much to my frustration, however, the brash incongruence from all of the chrome accessories now looked painfully hideous. OK, no worries. I would simply buy new towel bars and a toilet paper holder in a brushed nickel finish. My contractor was already on to a project for another client, but how hard could it be to replace these items myself? I would buy the same exact sizes, remove the old bars and slap the shiny new brushed nickel bars over top. Simple! 1) Rarely are things as simple as they look. 2) It usually takes longer than planned. 3) It typically costs more than planned. My simple project was no exception. As I removed the surface mounts, I noted huge holes left in the wall from previously removed toggle anchors. No worries. I would just put the new mounts over top and cover up the blemishes. No such luck. The positioning of the new towel rods exceeded the length of the previous mounts. Therefore, the mounts needed to be moved roughly 1.5 inches out from the original point. This resulted in the need to spackle the old sites and sand, measure, level and drill new holes for the new mounts. Really? All I wanted to do was craft a quick little facelift for my guest bathroom. Now I was going to have to set aside time to plan the project, identify and collect the needed tools, and actually do the work! Furthermore, I would need to find the leftover paint or attempt to match the color. Frustrated, I went down to the basement where the tools hibernate. I collected my power drill, level, Allen wrench set, Phillips and straight-head screwdrivers, spackle paste and applicator, sandpaper and (low and behold) a can of matching blue paint for the touch-ups. Armed with the tools, I went back up to the bathroom, laid out my tools and unfolded the instructions. Taking a deep breath, I accepted the situation, committed to the project and started the work. Acceptance and commitment therapy (ACT), developed largely by Steven Hayes in the 1980s, is a mindfulness-based behavior therapy that assumes the normal human experience includes destructive patterns that results in psychological suffering. ACT, based on empirical study, emphasizes values, forgiveness, acceptance, compassion, living in the present moment and accessing a transcendent sense of self. According to Russell Harris in his article “Embracing Your Demons: An Overview of Acceptance and Commitment Therapy,” the goal of ACT is to “create a rich and meaningful life while accepting the pain that inevitably goes with it.” Suffering and symptoms are not labeled and targeted for reduction. Often, it is our pathologizing of thoughts, behaviors and experiences that leads to attempts at symptom reduction or elimination. This pattern often results in disordered behavior — and the cycle continues. The aim of ACT is to transform our relationship with our difficult thoughts, feelings and experiences in a way that normalizes the experience. The byproduct of acceptance appears to be — wait for it — symptom reduction. The client initially denied her attraction to this co-worker and the role it played when viewing her less-than-perfect spouse. Once she was able to lean in to her feelings for the co-worker and assess the deeper meaning around her attraction, she recognized that she resented her younger husband who had always relinquished his power to her. He liked being taken care of, and she resented not having an equal partner. Armed with this revelation, the client was able to focus on her marital dissatisfaction in couples counseling rather than avoid it with the studly distraction at work. ACT interventions emphasize two main processes. The first is to develop acceptance of situations that are out of our control. Devoting energy and time to that which we have no control over is futile. The second is to commit to engaging in activities that cultivate living a valued and meaningful life. Again, there is emphasis on identifying that which is worthy of our efforts and energy. Furthermore, there are six core principles that guide the processes. Cognitive defusion: The ability to view thoughts, images and memories as simply bits of language, words and pictures. This is different than perceiving them as threatening events, rules that must be obeyed or objective truths and facts. For example, my thoughts around the bathroom project rested in the “I don’t have time” category. I have struggled often with this myth that there is never enough time. When I stopped obsessing over these thoughts, I was able to actually take action. Acceptance: The process of making room for uncomfortable feelings, sensations, urges and experiences, and allowing those things to come and go without struggling with them, avoiding them or giving them undue attention. Once I accepted the feelings of inconvenience and discomfort that originally paralyzed me, I was better able to begin the steps toward completing the bathroom project. Contact with the present moment: Focus on and engage fully in whatever you are doing. Being able to watch my progress from holes in the bathroom wall to finished product was satisfying. Each step provided me with a new sense of accomplishment. The Observing self: From this perspective, it is possible to note that you are not your thoughts, feelings, memories, urges, sensations, images, roles or physical body. Although these are aspects of you, they are not the essence of you. I knew this was a project that would stretch me out of my professor-clinician-author comfort zone, and it was possible I would not succeed. However, the project (regardless of the end result) would not define me or my worth. I realized that I am part of something bigger that transcends my spackling abilities. Values: Clarify what is most important, significant and meaningful to you. I like to think of myself as open and always ready for a new challenge. 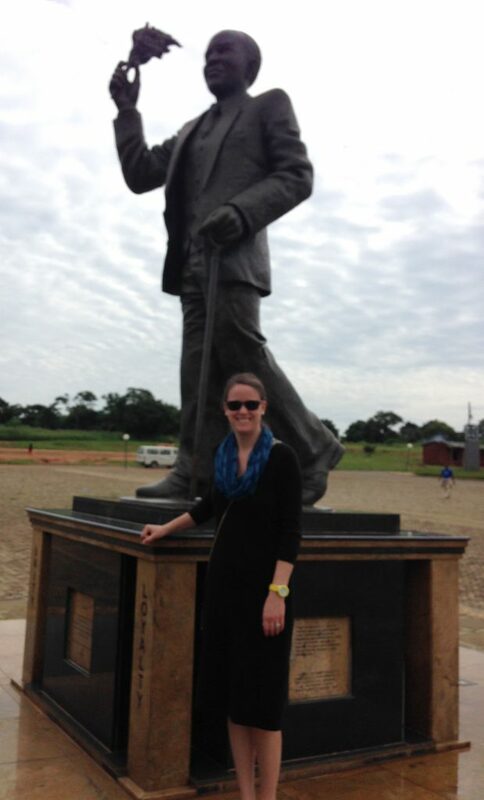 My “can do” attitude has taken me to (and through) some amazing and challenging experiences. Completing this project would validate my belief that I am capable of any endeavor with a little effort. Committed action: Set goals that are guided by your values, and take effective action to achieve them. Breaking down my bathroom project into smaller, more manageable steps proved effective. Step by step, I completed each task and experienced success in a way that propelled me to the next step. Ultimately, I experienced the sense of accomplishment in tackling this small but meaningful project. Clients often present an earnest desire to be pain free. We can assist them in reframing their understanding that the discomfort they are experiencing (which may be paralyzing) is a participant in their journey. It is the fear of this discomfort (anger, sadness and depression) and the desire to avoid it that creates greater angst. When we lean in to the situation, accept that it may be difficult and, during some parts, even unpleasant, we allow emotional space to engage in getting the work done! In other words, one can feel uncomfortable and still survive — even thrive and accomplish goals. Therefore, taking a bit of my own advice, I rolled up my sleeves, grabbed a drill and proceeded to hang my new towel bars. Once I was able to accept the temporary discomfort of engaging in this project, I was able to commit the effort required to complete it. The mess, previously underneath the shiny new mounts, had been carefully and completely tended to, allowing my new towel racks to hang solidly and sturdily, ready to take on their purpose: to hang my new bath towels.